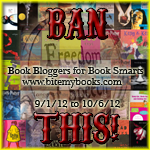 I know that it's typically Banned Book Week (this year, Sept 25 - Oct 2), but inspired by Bites, I'm doing Banned Book Month, September 2 through October 2nd. I'm still working on my content, but I hope to feature my favorite banned books and see what banned books all of you read. Any ideas? Let me know!